La Roca Village is situated in the village of the same name that is about 40 minutes by car from Barcelona center so it is a good idea to stay in one of the many city center apartments in Barcelona and take a day trip to the Village. You can get a bus from Fabra I Puig metro in the Sant Andreu district or a train from Sants Station. It’s well worth the time taken to get here because you will find top designer outlets at up to 60% off and some of the best retail therapy in the world. Being an outlet, it also has a Rebaixes period (seasonal sales) held in July and January when well known luxury brands are sold at a bargain prices. 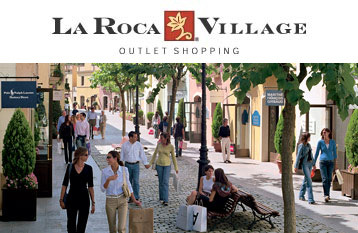 La Roca Village outlet shopping Barcelona has more than 100 boutiques of Spanish and international designers so you might consider taking break and tasting jamón ibérico and pan con tomate. Apparently inspired by the Modernista movement, La Roca is rather attractive, with its architecture in a traditional Catalan market town. You will be impressed by the fact that the buildings are so close together, with plenty of trees that provide sufficient shade from the sun. This entry was posted in Places, Shopping and tagged barcelona, roca, shopping. Bookmark the permalink.